If your business does not currently have accounting staff or if your business is outgrowing its current bookkeeping system, we can provide comprehensive bookkeeping and write-up services to ensure the smooth operation of the financial side of your business. As your business needs grow and change, we can provide input and planning assistance to make sure your accounting and financial systems keep pace with your business needs. Our Fees start at $60 per hour. Financial statements are an important tool for management decision making. Financial statements also represent your business to lenders, partners, potential buyers and other interested parties. We will work closely with your key personnel to review your bookkeeping and then develop and finalize accurate and timely financial statements. Constantly changing federal, state and local laws and tax regulations make payroll management an ongoing challenge for business owners. Our payroll services professionals are well versed on these laws and regulations. We can proactively alert you to material changes that will affect your business and your employees while also keeping payroll running smoothly no matter how large your business and your employee population become. We offer monthly and quarterly payroll services. The monthly service is a convenient and low maintenance tool. For a monthly fee of $60.00 (for up to five employees), you simply email your employee’s hours and hourly wage at the end of each pay period and we will report back to you with the amount of their paycheck. This amount already includes the taxes removed from their gross pay; direct deposit is available for a nominal fee. You will receive a pay stub for each employee so you have a written record of the payroll transaction; your employees will have access to their pay stubs and year-end tax documents via the internet. You would then be advised via your client portal of your monthly payroll deposits which are done electronically through EFTPS which is connected to your financial institution. All of the set up work is completed by us. Each quarter, Willow Creek Tax LLC will complete your filing requirements. At the end of the tax year, we will issue Forms W2 to your employees. The quarterly service is $100.00 per quarter (for up to five employees) and allows you to calculate your own payroll checks using worksheets that we provide. The worksheets are delivered to us through your client portal on a monthly basis and we determine your monthly deposits and advise you via your client portal the amount to be withdrawn from your bank account each month. This option allows you to save money, but the work to determine the correct amount of your employee’s paychecks is your responsibility. 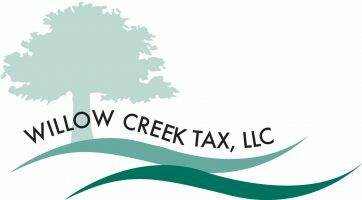 At the end of each quarter, Willow Creek Tax LLC will complete your filing requirements. At the end of the tax year, we will issue Forms W2 to your employees. Your employees will have access to their pay stubs (after the fact) and year-end tax documents via the internet. When and when not to start drawing Social Security has become a crucial tax decision. Let us help you overcome that hurdle. We will provide you with facts about Social Security and how it will affect your current financial position. We will try and make your retirement a little bit easier. State and local tax authorities are looking to maximize sales and use tax collections. We can help you understand and manage your sales and use tax obligations and prepare sales use tax returns in an efficient and timely manner. Effective tax preparation and planning can help you to minimize your future tax liability. We can help you proactively manage both your personal and your business tax issues, including understanding how upcoming business opportunities impact your tax status and vice versa. Not all tax planning opportunities are readily apparent. By having us on your team, you are more likely to benefit from those opportunities. We take pride in the fact that we keep current through continuing education classes and take the time to research areas of concern to understand how the latest federal, state and local tax legislation and other developments affect you and your business and we are constantly identifying new ways to reduce federal, state or local tax liabilities. We are able to accurately prepare your returns through the mail, email via our secure client portal and fax. So no matter where you are located we can help you out and provide services for you. It works like this; in late November you are provided with a tax organizer to use to help prepare for the upcoming preparation of their individual and business income tax returns. Along with the tax organizer collecting data you will want to include documents such as W2s, 1099s, 1098s, Schedule K1s, brokerage statements, student loan interest, etc. When you have gathered all your tax information, you should deliver to our office the tax organizer and the various tax documents at least 2 weeks prior to us setting up an appointment so that we can ensure that all information is included in your return during your scheduled appointment. Tax returns are completed in the order in which they are received in our office. Generally, you can expect your tax returns to be completed within a 10 to 15 business days; provided all requested documents have been included.